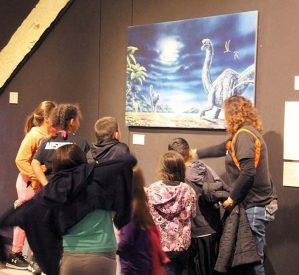 Children from an area school take a tour of the Dinosaur Museum. During last week’s Board of Trustees Meeting, Gretchen Gürtler, Director of the Mesalands Community College’s Dinosaur Museum and Natural Sciences Laboratory, presented the Museum’s 2017-2018 Annual Report. According to the report, there were a total of 13,645 visitors to the Museum last year, an increase of 4.6 percent. These visitors were from all over the U.S. and 38 foreign countries. Last year, the Dinosaur Museum also constructed a new exhibit entitled Our Changing World. This exhibit focused on global climate change and student research. The exhibit opened in September in recognition of Museum Day Live! an event sponsored by the Smithsonian Institution. The Mesalands Student Discovery exhibit was updated with specimens collected and cleaned by students enrolled in various geology courses during the 201 paleontology field season. A new case was also added to the Exhibit Hall that featured an Ankylosaur bronze skull. In addition, student researchers at Mesalands presented their research at conferences in New Mexico and Texas. Research projects in biology, paleontology, ice and water were conducted.